Summary: Paris, July 1942: Sarah, a ten-year-old girl, is taken with her parents by the French police as they go door to door arresting Jewish families in the middle of the night. Desperate to protect her younger brother, Sarah locks him in a bedroom cupboard—their secret hiding place—and promises to come back for him as soon as they are released. Sixty Years Later: Sarah’s story intertwines with that of Julia Jarmond, an American journalist investigating the roundup. In her research, Julia stumbles onto a trail of secrets that link her to Sarah, and to questions about her own future. 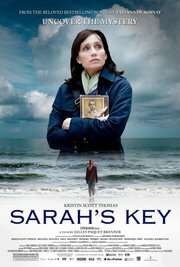 I can't believe it's been almost three years since I first read the wonderful novel SARAH'S KEY by Tatiana de Rosnay. This novel affected me deeply -- you can read my review here -- and I am thrilled that this story is coming to the big screen on July 22nd. 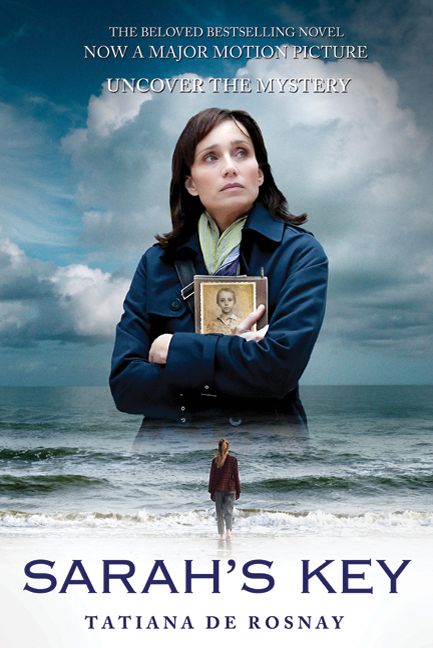 SARAH'S KEY is being directed by Gilles Paquet-Brenner and stars Kristin Scott Thomas, Mélusine Mayance and Niels Arestrup; and I absolutely can't wait to see it. One thing's for sure... it's going to be a tear-jerker! Based on Tatiana de Rosnay's New York Times best seller, SARAH'S KEY is the story of an American journalist living in Paris, Julia Jarmond (Kristen Scott Thomas), whose research for an article about the Vel' d'Hiv Roundup in 1942 in France ends up turning her own world upside down. In July 1942, Sarah, a ten-year old girl, is taken with her parents by the French police as they go door-to-door in the middle of the night arresting Jewish families. Desperate to protect her younger brother, Sarah locks him in a bedroom cupboard – their secret hiding place – and promises to come back for him as soon as they are released. Nearly seventy years later, Julia stumbles on the terrible secret that the home Sarah's family was forced to leave is about to become her own. As Julia's life becomes entwined with Sarah's heart-breaking story she must tackle the complex issue of how to live with the past and keep moving forward. If you are interested in learning more about The Weinstein Company, you can check out their Facebook page or follow them on Twitter. To celebrate the movie release of SARAH'S KEY, I have some very exciting news. Thanks to the fine folks at The Weinstein Company, I have the movie tie-in paperback edition of SARAH'S KEY plus a movie poster for one very lucky Booking Mama reader. To enter, just fill out the form below before July 20th at 11:59 p.m. ET. I will randomly select the winner the following day. Good luck! Thanks for the giveaway and I read this one last year and it touched me a lot. Can't wait for the movie. You are right it is going to be a tear-jerker. This sounds like a fantastic story. I'm very familiar with the Weinstein group, they make excellent films, and Kristen Scott Thomas is one of my favorite actresses. This promises to be a great movie. Thank you for the giveaway. I would love to read this. Thanks for the giveaway. I'm so looking forward to this film - the book is excellent! this was one of my favorite books! thanks for the giveaway! I am also a blogger and so happy to have found you thru fb under sarahs key.